The International Sports Law Review Pandektis is the official organ of the International Association of Sports Law (I.A.S.L.). It is being published once a year. Editor-in-chief is Dimitrios P. Panagiotopoulos, Associate Professor of the University of Athens and Secretary General of I.A.S.L., whereas the editorial board consists of several sports law scientists from all over the world. Since 2006 Pandektis is being published from the publishing house Nomiki Bibliothiki. 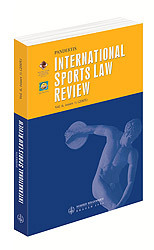 The publication is in English and the published papers concern both the field of academic research in the domain of sports law and the actual practice of sports, with view to contribute to the evolution of the science of sports law and the relevant subjects and also to assist the resolution of the practical problems of the national and international sports community. In order to achieve this goal, Pandektis covers the various systems of national sports laws and the international sports legislation and cites the relative jurisprudence (both national and international). The last issue of Ι.S.L.R.Pandektis contains several articles on current issues of the science of sports law (e.g. a paper concerning the rules of the new FIFA Regulations for the status and transfer of players), as well as articles on fundamental subjects of sports law (such as an article about the nature of the international sports legal order Lex Sportiva and its relation to the national ones). It contains also recent judgments of the ECJ, orders and awards of the CAS, as well as an announcement of I.A.S.L. JUDGMENT OF THE COURT (Grand Chamber), 6 March 2007, Joined Cases C-360/04, Placanica etc. SPORTS: SOCIAL INCLUSION OR RACISM AND XENOPHOBIA?